Although strictly speaking not a true cedar, because everyone calls it a Cedar we put in in this category when really it should be in the Cypress family, lets just say it is adopted for now. Japanese Red Cedar is a very large, vigorous, shade tolerant, evergreen tree that can grow to 70m or more with a >4m wide trunk and can live for a 1000 years in some places. The high quality wood has a red/pink colour with a pleasing scent and is light, strong, waterproof and holds off decay well as some other cedars do. According to the RHS, Japanese Cedar can be coppiced successfully, one of the few conifers that will. This does not make it suitable for hedging as coppicing is very different from pruning. Younger plants are quite conical in shape but the older ones are more irregular (a bit like humans, we get more irregular the older we get), pendulous and rounded towards the top. Older Japanese Red Cedar can have clear trunks of 10m or more. 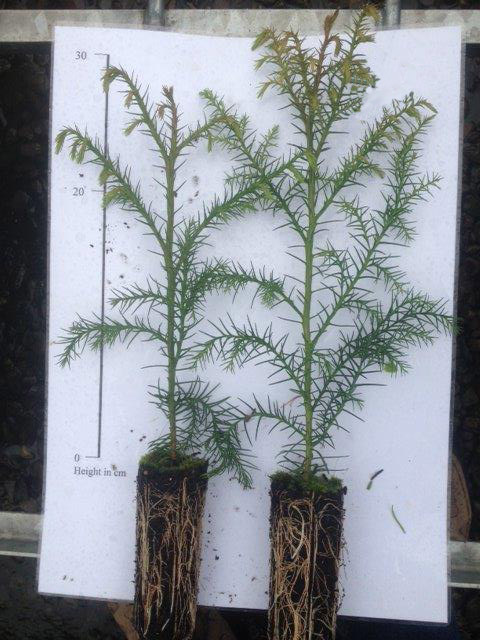 For fast growing Japanese Red Cedar you should plant in well drained, acidic and deep soils with warm moist conditions. Variations of this will slow the growth rate. Poor and dry soils,cold dry climates and peat or alkaline soils will severely slow the tree down. Areas of UK with more than 1200mm of rainfall are preferable. These usually include Wales or South West England. With the advent of climate warming areas of Western Scotland could be suitable. Pruning is part of the Japanese forestry care regime but this maybe more for aesthetic purposes. Possibly needed for branches that have broken under the weight of UK snow. If the foliage bronzes in cold weather, this is normal. Widely cultivated as an ornamental tree, it can be found in Japan, Azores Islands, China, Britain, Europe, North America, and regions of Nepal and India. 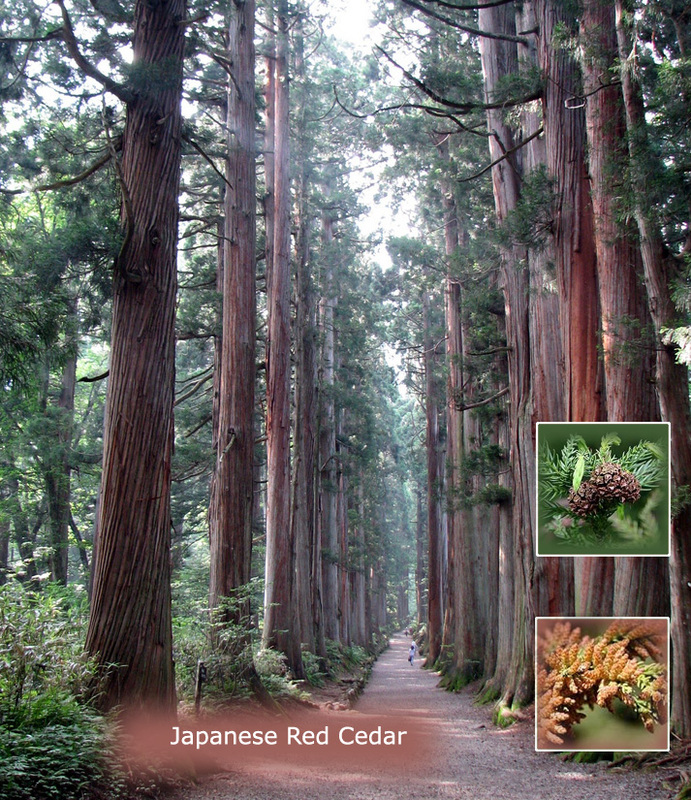 Japanese Red Cedar (Cryptomeria Japonica) is the national tree of Japan which may have been given away by the name. Found close to shrines and temples of Japan. The pollen shed in February can be problematic to asthma and hay fever sufferers. The foliage of the Japanese Red Cedar (Cryptomeria Japonica) is particularly dense and does not let a lot of light through. This makes growth difficult for plants underneath. Introduced into Britain in 1861 and the RHS gave it the Aware Of Garden Merit in 1993. Young foliage appears as a pale yellow and Red/brown bark peels in strips, with a bluish green foliage.